For those who suffer from them, allergies can be a very serious issue. Symptoms can range from sneezing, a runny or stuffy nose, a scratchy throat, allergic shiners (dark circles under the eyes caused by increased blood flow to the sinuses), coughing, and itchy, watery eyes, to eczema, or even asthma. Chronic allergies increase susceptibility to illness and can cause debilitating fatigue. 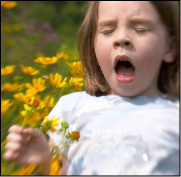 In children, infants, and the elderly, asthma caused by allergies can be particularly serious. For some individuals, the symptoms are of a less specific nature, including frequent headaches, general malaise, and even snoring. In fact, many individuals suffer from symptoms for years without ever knowing they have an allergy - and that there is a simple solution that will relieve their chronic symptoms. Allergies have many causes, including secondhand smoke, general pollution, dust mites, pollen, pet dander, and molds. Allergies can also be caused by sensitivities to one or more of several thousand chemicals and even perfumes. Allergies can be triggered by exposure to certain chemicals in individuals who never had an allergic relation previously. We see more an more cases each year where individuals who have been exposed to toxic pesticides develop allergies to a wide range of other common allergens, often to an extreme degree. While most allergies can be adequately controlled by reducing exposure to the allergen through avoidance and air filtration (and if necessary, using drug therapy), for a small population of allergy sufferers, the symptoms are so severe that everyday life is nearly impossible. In these patients, aggressive efforts to reduce allergen exposure may only offer temporary relief. The links to the specific common allergens noted above give some excellent recommendations on reducing exposure to these allergens - source control is always the first avenue of defense against allergens. Environmental control to reduce exposure to indoor allergens is a critical component of asthma management. When source control fails or is not sufficient to provide relief from symptoms, the good news is that most airborne allergens in the home such as pollen, dust mites, pet dander, and various gaseous chemicals, can be effectively controlled through proper air filtration. We have reviewed a wide variety of scientific test data and personally tested numerous air purifier models in an attempt to objectively evaluate different air purifier technologies and brands on the market today. Our own experience with various technologies backs the independent research that the single most effective means of eliminating allergens in the home is true medical-grade HEPA filtration. HEPA removes at least 99.97% of particles 0.3 microns in size and larger, and roughly 95% of particles down to 0.1 microns. Common allergens are much larger than this. HEPA filters with secondary activated carbon filters, UV sterilizers, or photocatalytic oxidizers are even more effective as they remove a wide variety of other chemical irritants and microbiological contaminants. For many, relief from symptoms can begin in as little as 24 hours after the purchase and installation of a high quality medical-grade HEPA air cleaner. Medical advisors worldwide recommend the use of medical-grade HEPA filters to control allergies and relieve allergy symptoms. For infant allergies, HEPA filtration is of particular importance since drug or medicinal therapies in most cases are not advisable.